This fall, Sangmyung University in Seoul, South Korea will begin teaching a course on PlayStation. Just check out the classroom. According to Inven, Ruliweb, and GameFocus (via tipster Sang), the university teamed up with Sony for the course, which uses PS4 consoles and PS Vita handhelds as part of the curriculum. The weekly, three-credit class teaches students about the game industry. Guest lecturers will also speak, and the course will cover topics ranging from video game history and game graphics to online gaming and marketing. There is even a field trip scheduled to a local game studio! And yes, there is a mid-term and a final exam. 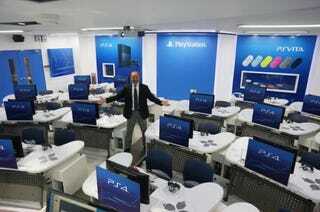 When the class is not in session, it will be open to other students as a PlayStation demo area.